The purpose of this Information Bulletin is to alert employers and employees about recent structural failures of the main support structure (chassis) on Liftlux models SL260-25 and SL245-25 scissor lifts. This information is being provided in advance of the conclusion of HSE’s investigations so that the industry can take prompt action to prevent a recurrence. During the incidents cracks propagated across the entire width of the chasses causing the machines to collapse as shown in Figure 1. Following these incidents a number of machines of the same models but different ages were withdrawn from service and visually inspected in the same area of the chassis. On many of the machines cracks were found that could potentially have led to similar failures. No similar failures have yet been identified in Liftlux models 210-25 and 205-25, although because these models are of a similar design, they should also be subject to the action detailed below. The size of the cracks found on the machines appears to be proportional to the registered hours of use, ie the largest cracks were found on the machines with the highest recorded service hours. This is indicative of a fatigue failure which occurs when cyclic stresses cause a small crack to propagate (grow) until it reaches a critical size. If undetected this could result in a structural failure of the chassis when the critical size (currently unknown) is reached. Preliminary examinations suggest that the fatigue cracks might have initiated in an area where several features of the chassis have been welded together on the underside of the machine as shown in Figure 3 & 4. Fatigue is then thought to have been induced by the constant cycling of the ram each time the platform is raised and lowered causing the crack to grow. The cracks showed signs of growing into the horizontal area at the side of the machine (near the starting batteries) as shown in Figure 2. In the later stages crack growth is believed to progress into the vertical section of chassis in the area shown in Figure 2. It is also likely that cracking may be present on the opposite side of the machine but this position is hidden by the tank for the hydraulic fluid. During examination, extreme care must be taken to ensure that the examination is done safely without a risk to the examiner should the chassis collapse. For example, additional props and supports should be placed under the machine chassis if the examiner needs to gain access beneath it. Park the machine on a firm, level, supporting surface free of overhead obstructions. Ensure the machine is shut down and the key removed. Locate and identify the chassis frame baseplate transverse weld as shown in Figure 3. 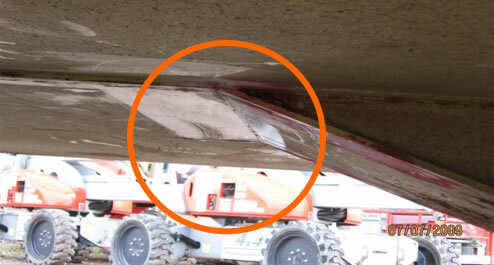 Visually inspect for signs of weld or parent metal cracks along the entire length of the weld. Replace the key, and prepare the machine for operation in accordance with its Operation & Safety Manual. 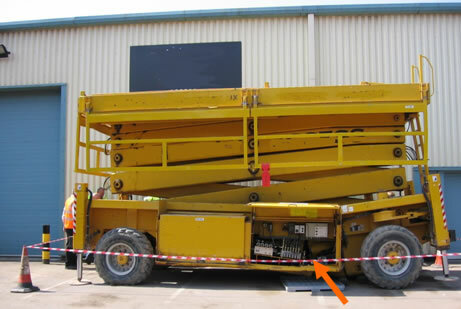 From the ground controls, elevate the platform approximately 2 metres, shut the machine down and inspect the area indicated in Figure 3 for signs of cracks on both sides of the Scissor Lift. 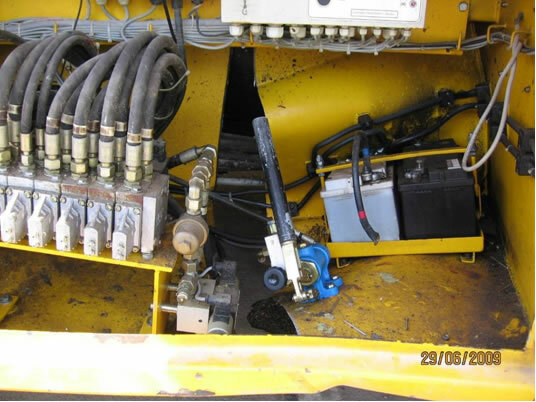 Locate and identify the hydraulic compartment as shown in Figure1. If any crack or other discrepancy is found, cease operation, remove the scissor lift from service and contact your Liftlux agent or competent person who should be able to advise you on the appropriate course of action to take. Should any further discrepancies be discovered during the accomplishment of this procedure, contact your Liftlux agent or competent person. If no cracks are detected then employers should determine a suitable interval time for re- examination of these parts of the machine by a competent person between thorough examinations. Regulation 9(3) of LOLER requires persons in control of lifting equipment to ensure that lifting equipment for lifting persons which is exposed to conditions causing deterioration which is liable to result in dangerous situations is thoroughly examined at least every six months or in accordance with an examination scheme and, if appropriate for the purpose, is inspected by a competent person at suitable intervals between thorough examinations. Further information is available in “Safe use of Lifting Equipment” Approved Code of Practice and Guidance (L113). Please pass thisinformation to anyone you think may need it. Fig 1. Scissor lift after catastrophic failure of chassis. Fig 2. 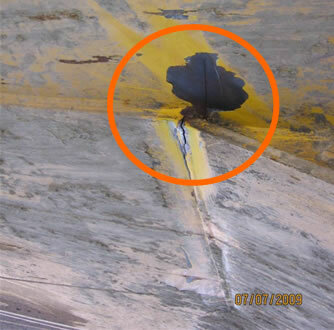 Hydraulics compartment showing area where catastrophic failure is evident. Fig 3. Showing transverse weld beneath body. This is at access end of the machine near the ram. Fig 4 Transverse weld beneath body showing weld failure.